In the late 1980s, I wrote several books for the National Academy Press in Washington, D.C., which are now all out of print. After a decade spent doing other things (working in the White House science office as a speechwriter, running an op-ed service, raising children), I wrote Mapping Human History: Genes, Race, and Our Common Origins, which was nominated for the 2002 National Book Award, won the Science-in-Society Award from the National Association of Science Writers, and was named a best science book of 2002 by Discover magazine. 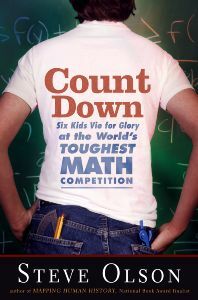 A couple of years later I published the book Count Down: Six Kids Vie for Glory at the World’s Toughest Mathematics Competition, which was named a best science book of 2004 by Discover magazine. I wrote the book Anarchy Evolution: Faith, Science, and Bad Religion in a World Without God with Greg Graffin, an evolutionary biologist from Cornell and the co-founder and lead singer of the punk band Bad Religion. My most recent book is Eruption: The Untold Story of Mount St. Helens, which was named one of the 20 best nonfiction books of 2016 by Amazon, received a starred review in Kirkus, and was an Indie Next selection. 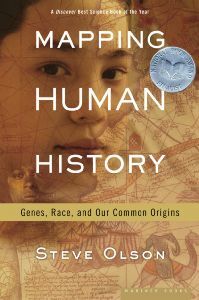 Mapping Human History uses the genetic differences found in people today to reconstruct the last 150,000 years of human history. By revealing the biological roots of our similarities and differences, it offers new ways of thinking about race, ethnicity, ancestry, and language. Count Down: Six Kids Vie for Glory at the World’s Toughest Mathematics Competition is a narrative account of the 2001 International Mathematical Olympiad, which was held at George Mason University just outside Washington, D.C. It follows the six members of the U.S. team, their coach, and their guide (who was a team member several years ago), describing the qualities that led the Olympians to be among the best high-school-aged mathematical problem solvers in the world. More broadly, Count Down explores the following question: How does anyone learn how to do something extremely well?